My baby had her first day at ballet class today. It was interesting. I am not sure I feel the way I thought I would after it was all said and done. First and foremost .. she looked good!! I mean she even has leg warmers on ... come on!?!?!? 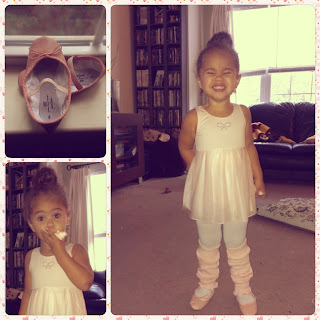 She loved her leotard with the shirt and loved that she had "dancing shoes". I guess now I talk about how it went. She is two (well two and a half). She is very tall for her age and alot of people think she is older than she is. I am use to that. We arrive at the dance studio and she is very excited. She keeps saying "mommy dance" over and over again. We go in and she immediate goes to the waiting area. I guess from watching her older sister dance, Ella is use to "waiting". That was the first "part".. keeping Ella out of the waiting area, away form the toys, in the actual dance studio was challenging. I eventually brought my older kids out and even at one point , they were doing stretches and ballet moves with Ella's teacher to encourage Ella to follow instructions. That's the second part, her attention span is short, apparently. She would do the moves a few times, catch a glimpse of herself in the mirror and would go off into her own word. As the other girls her pointing toes or being butterflies, my daughter was rolling around on the ground or running around in circle. My child was the only one not sitting in the circle or who was literally dancing to the beat of her own drum. I'll get to that thought in a second. Ms. Sarah, her teacher, was great!! She was teaching a class of 6 (maybe) and she did an excellent job calling the kids by their names and making it fun. 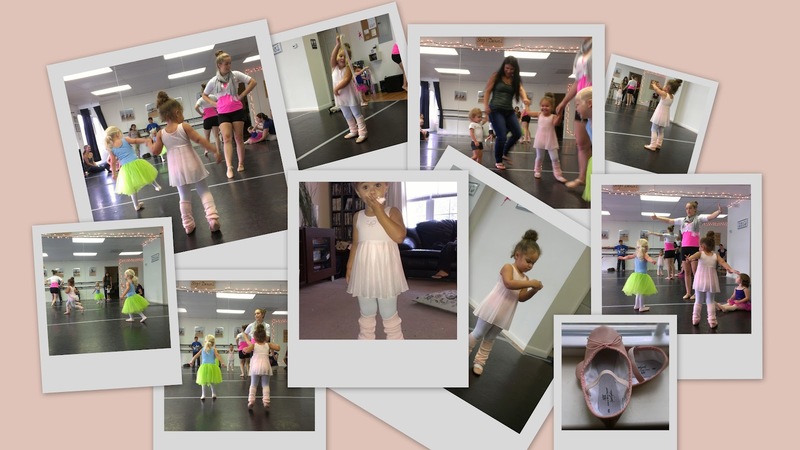 Ms. Jessica, the studio owner, Elyse's dance teacher and who has son the same age of Ella (or around there), was also there. Ms. Jessica kept looking at my saying this is normal, she is young, she will catch on in a few weeks .. alot of encouraging and supporting words (which I needed). I have always encouraged the kids to do what they love and to be who they want to be. If someone doesn't like what they are wearing, they can change, they can express themselves how they want (for the most part). Ella loves to dance and loves music. During the class, Ella was sometimes more interesting in the iPod the music was coming from, than actually dancing. She was the only child going around and talking to all the other kids. I was very happy to see my social butterfly trying to rally the troops in the beginning. But again, it would be my child being the maniac, being the one not listening, being "that kid". I am sure over time she will listen and partake however I am still willing to put money on the fact that during the showcase in May, Ella will be the one on the stage waving to mom and dad while everyone else is doing the routine. And you know what ... It will have been worth every penny!! As I type this .. Ella looked at me and said "Wook mommy, I jump over the moon", which is something she learned in class today!